Well, that’s nice. It feels good to finally review a film on here that isn’t a flabby dud—and it comes from an unlikely corner. Men in Black 3 is a charming, colourful and frequently funny third tale from Director Barry Sonnenfeld and Executive Producer Steven Spielberg. After the dry-heave-inducing second movie managed to screw up just about everything that was right and true and decent about the original Men in Black, I don’t think you could hold it against anyone for keeping expectations low. We can forgive, but you can’t neuralize that one out of our heads. Maybe ‘low expectations’ was the key, because Men in Black 3 defused my latent cynicism pretty quickly. Will Smith, returning to his role as Ebonics-spouting Agent J, is on a mission to stop the assassination of his increasingly surly and detached partner, Agent K (a noticeably weathered Tommy Lee Jones). K is being hunted by one-armed space nasty Boris The Animal, played expertly by Jemaine Clement (of Flight of the Conchords fame). In order to stop him, J travels back to 1969 to find and protect a much younger K, played pitch-perfectly by Josh Brolin (No Country For Old Men). The ensuing time-travel tale weaves together some very clever set-ups that play with all manner of paradoxes, sight gags and some elaborate action sequences surrounding one of mankind’s greatest scientific achievements. You can’t take these guys anywhere. Jemaine Clement’s Boris The Animal deserves a special call-out at this point. I can’t think of a villain I’ve enjoyed this much in a long time. The hulking, lens-eyed monstrosity is a dark delight to watch – and Clement is unrecognisable, which really points to his talent as a performer and physical comedian too. Smith, who doesn’t stretch his personality a great deal to fit the role of J, remains very engaging. 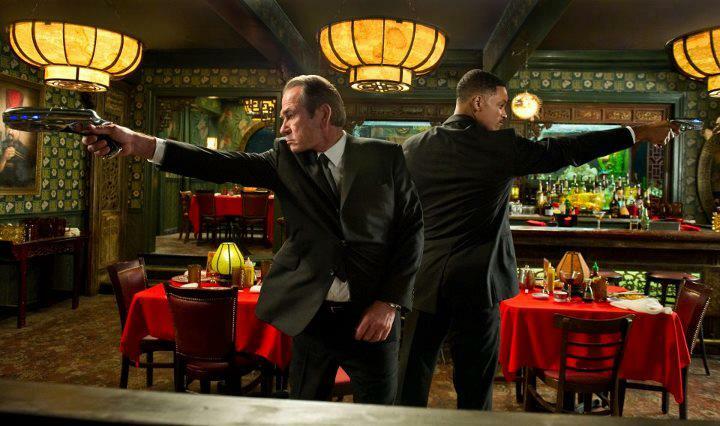 The odd-couple dynamic between he and Jones, as well as Brolin, gives Men in Black 3 its true emotional core. It was surprising to me how genuine and sometimes poignant their friendship becomes. It harkens back to those softer moments in the original Men in Black that won me over; it has heart – and not in a manipulative way, either. It’s richer than that. Spielbergian, even. Of course, there’s a patent silliness to Men in Black 3 that is inescapable. It’s not a bad thing at all – it’s just a sense of humour that is softer and more universally appealing than you might expect. The teen market is centre of the target, but again it’s the inventive characters and creatures that will win over demographics either side of this. It’s a film of visual wonders – like a guided tour through an interstellar zoo that only pauses to pull gags and keep the action going. 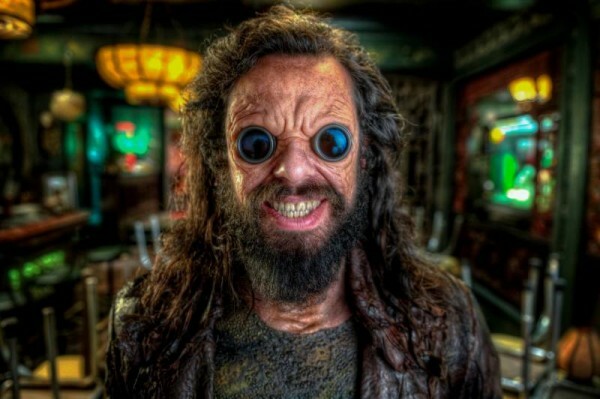 Jemaine Clement steals the show as Boris The Animal. The support cast sometimes feels a little under-utilised. Emma Thompson’s Agent O, who replaces Rip Torn as head of the agency, is mostly a device to shoehorn in a romantic involvement with K. The other cameos – who we won’t spoil – are also so fleeting that you’ll wish there was a little more screen-time to explore them. Still, it’s a movie built around answering some lingering series questions (and arguably raising a few more too) between J and K.
Too often sci-fi epics miss the balance between spectacle and storytelling. While Men in Black 3 isn’t always consistent in humour and pace, Sonnenfeld, with a well-considered script from David Koepp, manages to make it work. It’s a hard-fought and well-earned return to form – now let’s hope Hollywood can let the brand retire on a high note.